Surrounded by a lush landscape outside and rustic luxury inside, settle in for an evening of culinary joy for your palette and charming rural ambience for your soul. Enjoy a glass of wine or one of 50 of the world’s finest bourbons. 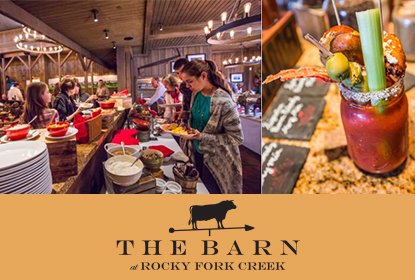 Whether celebrating or relaxing, the best seat in the house for making memories is your seat in The Barn at Rocky Fork.